Garrett Michael has led Sabetha to back to back state titles. Sabetha captured its second straight Class 3A state title. Last year, 3A had 64 squads. This season, the classifications changed and 3A became the most difficult classification with five teams that played for a state crown in 2017 in 3A this year. Sabetha went 13-0 and defeated Pratt in overtime on the game’s final play to win the state title. The Bluejays also overcame tragedy from 2017. After the championship game, a car wreck claimed several members of the Ukele family. Sabetha averaged 308 rushing yards a game, had one of 3A’s top defenses and committed just 10 turnovers. Keim Trucking would like to congratulate head coach Garrett Michael on his Coach of the Year honors from Sports in Kansas. Proud of you and the 2017 and 2018 state football champions! Clark, now 117-36 after 13 years with the Panthers, led Derby to its fourth state title in the last six years. Derby won crowns in ’13, ’15, ’16 and then earned runner-up to Blue Valley North last year. This season, Derby defeated BVN, 24-16, and allowed just 7.9 points per contest, best in Class 6A since at least 2006. Derby had a massive defensive improvement after it permitted 27.4 points last season. Additionally, Clark replaced two-time all-state running back Brody Kooser with new tailback Tre Washington, and had to make a quarterback change for the second straight year. The last two falls, Grant Adler went down with an early-season injury, and Hunter Igo moved over from safety to quarterback. Igo, which collected second team all-conference at all three phases and was Top 11 all classes, passed for 1,068 yards with a 17/4 TD/INT ratio. Washington, after he received little carries early in the season, finished with 231 rushes for 1,836 yards and 24 scores. Igo delivered 931 rushing yards. Derby’s defense, led by Isaac Keener, allowed just 39 rushing yards a game and 1.5 yards per carry. The Panthers had standout defensive games against great running backs/offenses, including Salina Central, Maize, Bishop Carroll, Topeka, Manhattan and BVN. Also impressively, Derby continues to dominate with lack of Division I football players, a rarity among top 5/6A schools. Dreiling captured seven state titles at Hutchinson, and then came to Aquinas to bring the Saints their first football crown. He is 49-13 in five seasons with Aquinas with state runner-ups in ’14 and ’17. This year, the Saints rolled to the state title with a total margin of 559-174. In the regular season, Aquinas had a big win versus rival Bishop Miege, and led by a highly talented offensive line, captured every playoff game by at least 21 points. 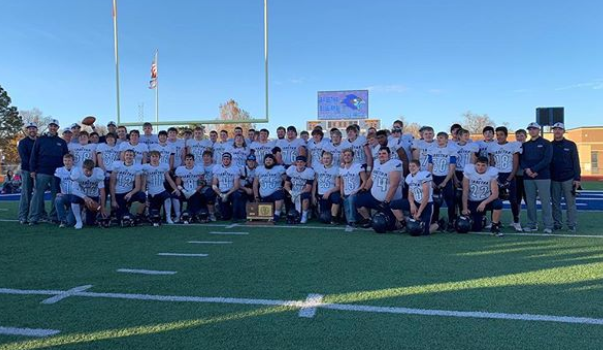 Aquinas earned the Eastern Kansas League title, the state’s best conference. Tank Young set the Aquinas single season rushing record and Aquinas, which returned just three offensive and four defensive starters, capably replaced quarterback Will Swanson with quarterback Tate Raboin. St. Thomas Aquinas High School would like to congratulate Coach Dreiling on bringing home the first ever state footaball title to STA. Congrats on an undefeated season! Go Saints! Beason took over for coach Scott Vang, who led Goddard to a state runner-up and final four appearance in the last two years. The Lions dropped down to 4A from 5A and graduated its bevy of all-state players, including quarterback Blake Sullivan, lineman A.J. Vang, linebacker Justin Amaro and defensive back Ian McSwain. Goddard advanced to the Class 4A state championship game and lost to Bishop Miege. The Lions, which paced 5A in fewest points allowed per contest the last two seasons, went 10-3 and permitted just 16.7 points per contest. Goddard scored just 25.5 points per game, third-lowest among all 11-man state finalists since 2014. However, the Lions’ elite defense and multiple coaching moves helped Goddard pull off several close victories. Goddard went 2-1 in one-point contests, including a 15-14 sub-state road win at high-octane McPherson. The Bullpups had set multiple team records for offense and enjoyed its best start in more than 90 years. Goddard intercepted McPherson at the goal line on a diving play at the end to secure the win. In the quarterfinals, the Lions defeated Wellington, 28-14, on the road. Goddard came back in both playoff wins. Additionally, Beason changed the offense, used a tight end, and had a surprise for his team after a 32-3 win versus Andover in Week 8 that clinched the AVCTL Division II title. Beason had made conference championship shirts and surprised his team on the field with them after the game. Junior Zeke Howell (5-11, 170 pounds) had 75 tackles, 21.5 for loss and 18 sacks. As a sophomore, Howell had no tackles but blocked four punts. Goddard’s defense forced 35 turnovers, and the Lions forced plus-8 in turnover margin. In 2017, Riley County finished 7-3, another above-average year that didn’t end with a long playoff run. The Falcons passed for just 27 yards a contest and rushed for 331 yards a game. After the season, 35th year coach Steve Wagner knew RC needed to make offensive changes and couldn’t be so run-heavy in the playoffs. RC went spread with new quarterback Garrett Harmison, who had never thrown a varsity pass before. The Falcons finished 10-3 and earned a surprising 2A runner-up to Phillipsburg after they were not ranked in the preseason. In the quarterfinals, Riley County defeated Mid-East rival Silver Lake, 40-34, in a wild finish that ended in overtime. The Falcons defeated SL for the first time since 1996. RC went to the third championship game under Wagner after losses in ’88 and ’93. Riley County passed for 163 yards a game and rushed for 212 yards a contest. Harmison set school records for single-season passing yards. Against Silver Lake, he completed 24 of 46 passes for 353 yards and four touchdowns and set the school record for most completions in a contest. Before the Silver Lake win, Riley County beat Southeast of Saline. In the regular season, RC lost to both SES and SL. Riley County High School would like to congratulate Steve Wagner on the 2A Sports in Kansas Coach of the Year. Congrats to the Falcons on an outstanding season in 2018! Smith Center, 12-1 each of the last two falls, captured its second straight state title after a 2-1A crown in 2016. Just like last year, SC continued to improve throughout the season, most notably reflected in the scores against Plainville. This year, Smith Center had to replace its quarterback, its top-three rushers, all 43 of its receptions and its top-five tacklers. Smith Center again paced its classification in scoring defense for the third straight season. The Redmen had eight turnovers last year and had just five miscues this fall. The Redmen passed for 26 yards a contest and rushed for 331 yards a game. Smith Center defeated Plainville, 21-10, in Week 4 in a game it trailed most of the second half. In the playoffs, SC easily defeated Plainville, 49-7. The Redmen beat Olpe, 59-0, at state. Olpe entered the game No. 1 in 1A in scoring offense. In a statistical quirk, Smith Center received 126 carries for 1,348 yards and 18 scores from senior Ethan Peterson. Senior Colby Benoit had 113 rushes for 1,280 yards and 24 TDs. Senior Hesston Maxwell had 155 carries for 665 yards and eight scores, including a great performance in the first playoff victory. All three running backs led the team in a different category – carries, yards or touchdowns. Sasse, a Smith Center graduate and former longtime assistant who took over after Roger Barta retired, is 56-14 in six years. Barta won eight titles, and Sasse has two. Smith Center’s 10 crowns tie Lawrence for the most in state history. In 2017, Claflin-Central Plains lost to Spearville in the second round of the playoffs on the final offensive play. The Oilers had fallen to the Lancers in the second round for three straight seasons. CP went 9-2 and had multiple injuries to key players, including Brett Liebl, Alex Hickel and Lawson Oeser. Grant Heldstab was not a starter. The Oilers graduated their top-six tacklers. This season, CP finished 13-0 and permitted just 34 total points, the best eight-man scoring defense in at least 15 years. The Oiler eight defensive starters all had sizable improvements from ’17, except senior defensive back Devin Ryan, the lone returning first team all-state player, who virtually matched his totals from his junior year. CP’s defense had no starter above 202 pounds and was smaller than multiple teams, most notably defensive state champion Hoxie in the quarterfinals. Still, the Oilers’ great speed and athleticism, especially on the defensive line, delivered a dominant season. Steiner, also the powerlifting coach, had great summer participation, a key reason for the improvement. Heldstab, Mason Doll and Liebl finished as the top-three tacklers and combined for 58 tackles for loss. The Oilers held Solomon to negative total yards in the state game. Steiner, a Claflin graduate, also led CP to the ’14 state title. Steiner is 77-22 overall. Dighton’s win total (nine) matched the number of players on its roster. In one of the top stories of 2018, the “Dighton Nine” finished 9-3 and lost to Osborne in the sub-state title game. Dighton lost twice in early season to top-five Division I teams Hodgeman County and St. Francis and then went undefeated in district play. In the quarterfinals, Dighton delivered a minor upset with a 44-36 win against Otis-Bison with a remarkable catch by David Cramer in a play that went viral. Dighton had a two-win improvement off last year. Simon is known for its elite QB/WR combinations and produced a huge season from Blair Hoffman. He passed for 1,627 yards with a 37/2 TD/INT ratio. He rushed for 865 yards and 11 scores, and twin Dalton Hoffman had 874 yards and 10 scores. Cramer finished with 62 catches for 992 yards and 20 scores. Simon is 52-29 in eight seasons with the Hornets. Two seasons ago, he also won classification coach of the year when he led Dighton to the state title game, its best finish in school history. Clow led Weskan to its second six-man title in three years after a crown in ‘16. The Coyotes opened 1-2 with losses against Pawnee Heights (39-37) and Moscow (58-32) in Weeks 2-3. In Week 6, Weskan defeated Golden Plains, 52-46, in a key victory that led to a North Division title. In the playoffs, Weskan avenged the Pawnee Heights’ loss with a 55-38 victory in the semifinals. In the championship game, the Coyotes defeated Golden Plains, 75-44. Jace Mackley had a huge fall with 170 of 261 passing for 2,116 yards with a 44/6 TD/INT ratio. He rushed 82 times for 767 yards and 10 scores. Weskan had balance at receiver with four players – Mac Purvis, Zack Box, Dalton Mackley and Tracer Vincent – with between 28 and 44 catches.